It's official: my first two weeks of JJ100 training are in the books. The verdict? Pretty darn good. Other than my little spill on Friday, things are well, and that's a great thing to report. I actually ran a few miles over my intended mileage both weeks. That's a rare event. It just sorta happened that way. I have felt a bit like my body has reset its running clock and the last two weeks have felt kind of...awkward...though not altogether bad. It was weird, like my legs forgot how to run. My knees knocked every so often (that hasn't happened since my college running days when I was lazy and had crappy form! ), I kicked my ankle bone here and there, blisters pop up out of nowhere, I tripped and fell (again, that hasn't happened in a LONG time, on pavement), and my 'easy' pace has been feeling quite labored. Today's run was no different...I couldn't find my groove, my rhythm, my boom-shocka-locka. I also ran in a new pair o' kicks (Brooks Ghost 4s) in an effort to start easing them in while also easing out my close-to-retirement Brooks Ghost 3s. My feet were all slippy slide-y inside my shoes, like they were clown shoes and the insole was slick. I sort of fantasized about ripping them off, setting them on fire and then throwing them in the lake while doing a barefoot happy dance on the shore whilst watching them disintegrate. But then I decided maybe I was overreacting and that I should find solace in knowing tomorrow's run in them will totally rock the casbah. I should now mention the degree of awesome that our Saturday long run ended up being. It was a very high degree. We started in a light drizzle, heading south. The legs felt brand new and totally rockin' for once and we flew through the first 10 miles or so. It was amazing. I wondered if I had had a leg replacement done in my sleep. We had planned initally to run south for a bit, then turn back north for a bit of a change in scenery. But after a loop around Northerly Island, we silently decided to continue south. It stayed cloudy, thankfully, so the steambath we were already running in didn't turn into a full-on wet sauna, thank goodness. Geof had 24 on the schedule and I had 17, but since we had a Cubs game to get to directly after our run, it was looking like our less-than-three-hour window for running was only going to allow my 17, so that's what we were shooting for. Geof's piece-of-crap GPS (it is SUCH a POS, and I think we've finally decided it's time to retire it and return to the trusty Garmin :)) wouldn't link up from the get go (after standing around in the rain for 15 minutes, waiting to see if it would start), so we were working off of pace to judge our turnaround point, and rough memory. Once we turned around, at what we thought was about 9 miles, I started a slow mental downward spiral. Just a general feeling of blah, and an overall feeling of wanting to be done. Instead of being a total wretch, I decided to practice my 100-mile reminders: this, too, shall pass. And, it did. It just took a little bit of patience, and dropping my very last Honey Stinger Waffle on the ground, whilst exclaiming, "oh, f**k!" in front of passing runners and cyclists. You better believe I picked that sucker up, dusted it off, and ate it. Hey, five second rule. My legs were feeling less than jazzy towards the end, but I was mentally much more spritely knowing that baseball, beers and hotdogs awaited us! Finishing up in just enough time to allow us a whole 14 minutes to clean-up, pound a smoothie, and get downstairs to meet Richard and Tilly and head to the game. So, Sunday was a time-on-feet day...walking around the Museum of Science and Industry all afternoon, finally getting to see the Bodyworlds exhibit (AWESOME!!!) and the Smart Home exhibit (also AWESOME!!!). Did I tell you about NF50? No? Well, Geof and I decided to sign up for the Wisconsin edition of the North Face Endurance Challenge - 50M. The timing with our training was just too perfect, so we'll be running that one together this time. I ran it back in 2009 and had an okay time, but I was also undertrained, overraced, and totally wiped from the season. I am really looking forward to this one this year! One last really random thing, I tried this really good drink yesterday that I grabbed while we were in line at Whole Foods. It's called Ginger Soother and it is DELICIOUS. 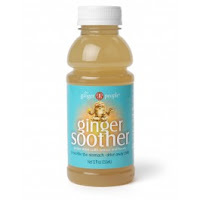 Our friend Jim mentioned a ginger juice he'd used throughout Burning River 100 the week prior and when I saw this at the store I figured it may be what he was talking about. It's by the same peeps (Ginger People) that make Ginger Chews (aka stomach lifesavers). Geof and I both agreed it is quite yummy...of course we are both big, big fans of ginger and would eat it in bulk if given the chance :) So, if you see it somewhere, pick up a bottle and give it a try. I'm thinking it could be worth its weight in gold during the late miles of a 100M, when the tummy feels a bit on the fritz. Nice to hear that your training is going well, and that you were able to have a good one in there among the not so good ones. I bet there will be more of those good ones as you adjust to the high mileage. Love the ginger. I'm going to have to try that drink. I just started juicing and adding fresh ginger to my homemade V8..it's gr8. Good to hear your crash hasn't set you back too badly. In my opinion, 20 paved miles is pretty stout, especially mentally. 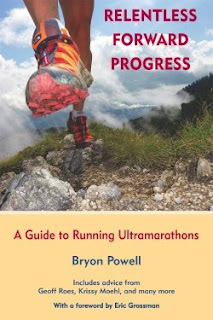 It's so much easier to run for 4 or 5 hours in the mountains than for 2 or 3 on the roads. Why is that?! Thanks for mentioning the ginger items. Can you believe that's one thing I've not tried to calm my finicky stomach? For no good reason. Must do. @Dax, there are so many ways to incorporate more ginger, it's awesome! We've added it to our morning smoothie before, to stir-frys and to salad so far. YUM. I love the sound of homemade V8! @Stacy, running roads can be soul-sucking; running mountains/trails is soul-reviving :) I can NOT believe you have yet to try ginger! I would have been pushing it a lot sooner had I known! It has saved many a friend's stomach in races. Get thee some ginger! The chews are my fave for the pukies, but I'll be trying this juice next time as well.